NBC's Saturday Night Live's Pete Davidson isn't necessarily known for being upbeat, chipper or bubbly. That's why it didn't come as a surprise when The Walking Dead's Norman Reedus, who dropped by the set last night, mistook him for a zombie. While the skit wasn't the best, Norman Reedus' surprise appearance, on the heels of AMC's The Walking Dead's monstrous Season 5 finale, certainly livened things up a bit. 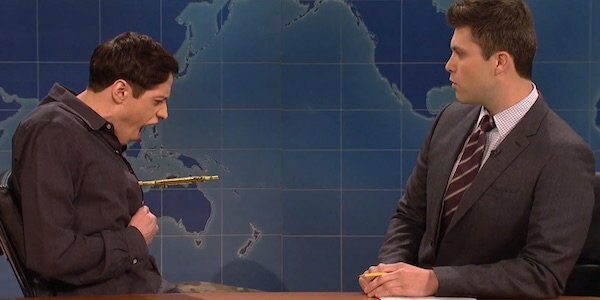 Prior to his showing up, Davidson and “Weekend Update” anchor Colin Jost seemed like they could go on forever aimlessly, talking about getting high — something they were surprisingly able to do for over two and a half minutes without providing nearly a single laugh. Tying in the idea that there is a real zombie apocalypse coming in our near future, however, and that when it arrives Davidson will potentially be mistaken for a zombie due to his sluggish appearance and always-bloodshot eyes, was admittedly kind of funny. The moment where he actually got shot with the arrow was also inarguably a definite attention-grabber. 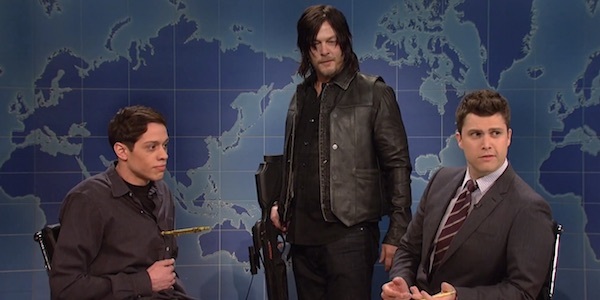 Although Davidson's Resident Young Person sadly had to be shot with an arrow to help bring the skit to a close, it was worth it to get Reedus' Daryl Dixon to step on the set. Reedus' mistaking Davidson for a zombie and thus taking the shot could have delivered a bigger laugh if not somewhat spoiled by the skit's earlier dialogue. Nonetheless his arrival certainly helped inject some adrenaline to the bit and provided the Saturday Night Live cast members a much needed segue. Reedus' appearing on SNL follows last week's Season 5 finale of AMC's The Walking Dead. The 90-minute episode pulled in the series' highest ratings to date, totaling 15.8 million total viewers with over 10 million adults in the coveted 18-49 demographic. The amazing record-breaking numbers closed out a very successful Season 5 — one that ranked in the top 50 TV telecasts for all 16 episodes. It should be noted this is the first time in history a cable series has ever pulled that off. While last night's Saturday Night Live “Weekend Update” skit wasn't exactly laugh out loud funny, there were a few solid moments in the Michael Keaton-hosted episode. Most notably, was his opening monologue, in which Michael Keaton reprised … err, sort of … his iconic roles as Batman and Beetlejuice.